The American Song marked a new era for American Cruise Line as she launched service earlier this month from New Orleans as the first in a series of at least five new modern riverboats. Operating ships under 200 guests, the company controls a large percentage of the U.S. domestic river market. The new American Song will stay on the Mississippi through the New Year and then head for the Columbia and Snake Rivers. The following two ships in the series are slated for Mississippi service. This past summer, the company doubled its capacity in Alaska and is putting in more berths next year in response to demand. 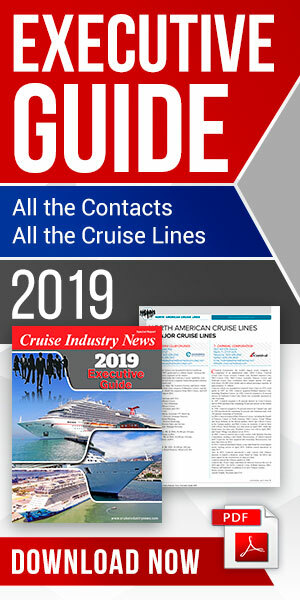 “We have an extraordinarily high repeat rate, which has driven our marketing cost per passenger day down,” Robertson said, in an interview with Cruise Industry News. The new series of vessels feature a glass atrium and more modern amenities. New propulsion technology enables faster and more comfortable sailing. Despite being bigger, the new ships are also more fuel efficient while offering balcony accommodations to all guests. A telescoping bow ramp makes disembarkation easy. Shoreside, the company has expanded office space at its Connecticut headquarters, while a call center in Utah has grown. “We’re spending an enormous amount of resources on training,” Robertson continued. As the expansion ramps up, the company plans to train 2,000 employees annually.